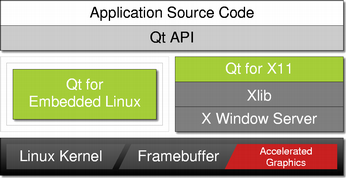 Qt for Embedded Linux applications write directly to the framebuffer, eliminating the need for the X Window System and saving memory. The Linux framebuffer is enabled by default on all modern Linux distributions. For information on older versions, see http://en.tldp.org/HOWTO/Framebuffer-HOWTO.html. For development and debugging purposes, Qt for Embedded Linux provides a virtual framebuffer. It is also possible to run an application using the VNC protocol.